The Moonshot 1500 chassis holds up to 45 server cartridges plus redundant network switches. It includes a shared base-plane with three multi-terabit high-speed fabrics: to connect server cartridges to the network, to connect server cartridges to neighboring server cartridges and the 2D Torus fabric. Power is delivered through a pooled-power back-plane that ensures the full capacity of the hot-plug power supplies is available to all cartridges. Up to 45 server cartridges per chassis. Up to 2 independently paired network and uplink modules supported simultaneously within the chassis. Five dual-rotor, hot-plug, redundant fans as standard. 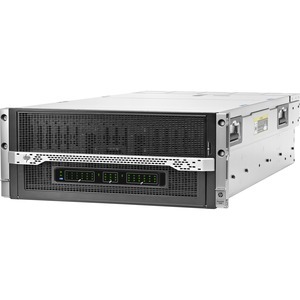 The HP Moonshot 1500 Chassis Management module manages the health of the chassis and servers. Investment protection: Accommodates multiple server and network designs in one enclosure. Lower power consumption, in comparison to rack-mounted servers.